Taking a break from my personal history through the tech industry, here’s a quick graph which like most things tech I expect to be obsolete tomorrow. About 13 hours from now, the corporation designed in Cupertino should announce a new crop of cool stuff. A lot has been made about how innovation at Apple has taken a dive since the passing of co-founder Steve Jobs, from news reports to serious books from major publishers. What’s been so funny to me is how no one seems to be willing to look at the data, which seems pretty clear. Here’s the graph I drew on our kitchen wall (a big whiteboard) to explain to my wife why all the “innovation at Apple is dead” people are wrong — or at least, that it’s far too early to make a case against the death of the company’s creativity. It’s two graphs, actually: one shows all of what I consider to be Apple’s most loudly heralded products, including some of their most market-impacting variants, and the other shows only the biggest, most iconic Apple products going back nearly 20 years. 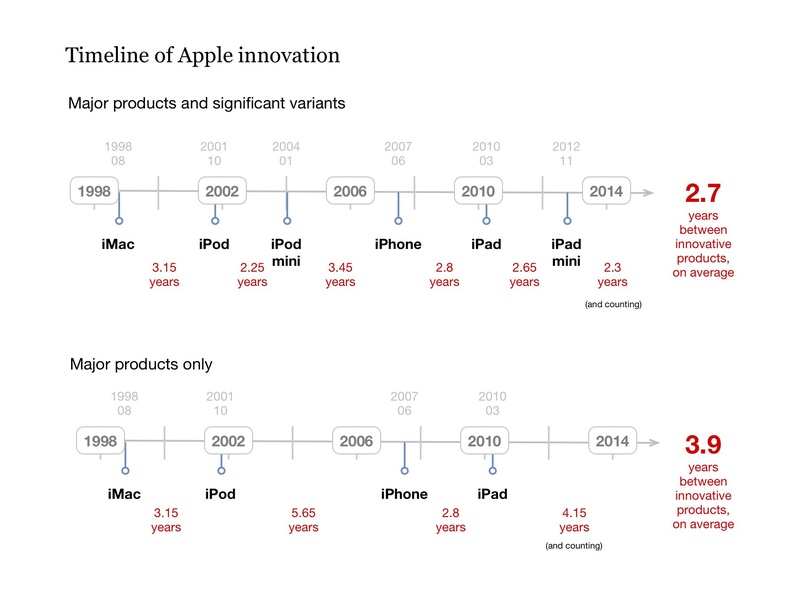 If you include things like the iPod mini and the iPad mini, the time between innovative products averages 2.7 years. If you only include the biggest bangs, the average between then jumps up to 3.9 years. I had a buddy whom I trust once tell me that it takes a little over three years to do something truly great. This lines up pretty well with the data from Apple product releases. We like to see Apple put out great new stuff with every new keynote, but the truth is that most Apple updates are incremental — from the original iPhone to the iPhone 3G in one year, then to the 3GS in another year, and finally to the very different iPhone 4, which itself could’ve earned a place on our timeline. But in the spirit of holding Apple’s harshest critics to their own high standard of what passes for innovation, these charts don’t cover any iPhone releases other than the original. It also doesn’t cover software or services, like the iTunes Store, which changed the music industry, or Final Cut Pro, which impacted video authoring. It doesn’t mention the miracle of Apple’s transition to Intel chips for their Mac platform. These are just the bigger boys, the ones for the history books. Today, it’s been 4.15 years since the last fantastic Apple release, the iPad. Can you believe it’s been that long? I hardly can. But that’s only a quarter of a year longer than the average amount of time between major, industry-shattering releases. That’s just another product cycle for Apple. Take this further. People have been bemoaning how creativity began seeping out of Apple once Steve Jobs died. Really? Was he only working on projects with such a short-term insight and impact that two years after his death we need to close out the possibility of anything cool coming out of Apple ever again? Or what if he was the forward-thinking visionary he’s sold as being, that he has to be in order for Apple’s critics to have a point in the first place? What if he was working a full product cycle out in advance of the current developments? That would put the impact of his personal ideas at Apple as far as 8 years out beyond his death. Even if you buy into the “Apple is doomed” narrative, that allows for as much as five more years for lesser creatives to drop the ball. Even if all that Apple executives and designers do for three more years is phone in whatever plans Steve Jobs left for them in a folder on his desktop, they should still be set for a long time to come. Now, admittedly, Apple critics almost never give new products out of Cupertino their due. The iMac didn’t have a floppy disk drive, so it was doomed. The iPod wasn’t even a full computer, and vastly more expensive than its competition. The iPhone was late to the party, didn’t have a physical keyboard, and was certainly not going to walk into a market where people had been putting out successful devices for years. The iPad was just a big iPhone. So whatever comes out of Apple tomorrow will likely be dismissed with similar terms. And even if all Apple does tomorrow is turn the crank on their software and preview an incrementally new iPhone, it still doesn’t mean that innovation is dead at Apple. They could wait another six months to show something that meets their internal yardstick of cool before starting to push the boundary of the longest period of time between major, industry-shaking products. But I don’t think we’ll be waiting that long.